Today’s question comes via email from Susanne from Sweden. I have some questions too. Do you know if there are any yoga practices for hypothyroid? Hypothyroidism refers to a condition where the thyroid is producing hormones below its normal level. Low levels of hormone production from the thyroid can result in fatigue, depression, constipation, weight gain, puffy face, hair loss, irregular menstrual cycles, facial hair growth and swelling in your throat. Your thyroid is located at the bottom of your neck, just below your adam’s apple. We go into detail on balancing your thyroid in the perimenopause yoga class on our membership site. We will also do alternate nostril breathing for your pituitary gland because the thyroid gland is regulated by another gland that is located in the brain, the pituitary. Also, I would highly recommend you check out our Yoga for Menopause Series on our Membership Site. The perimenopause and menopause classes and herbal remedy classes have lots of yoga postures and herbal remedies to help with hypothyroid issues. 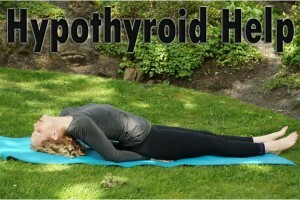 What yoga poses have helped you balance your thyroid gland?